If you prefer you can also view the online version with all words on one page. It can be tricky or downright impossible to keep up with all-things-marketing nowadays. The difference between reach and impressions, the ways CPMs and CPEs are calculated and the meaning of Hauls and Flat Lays. 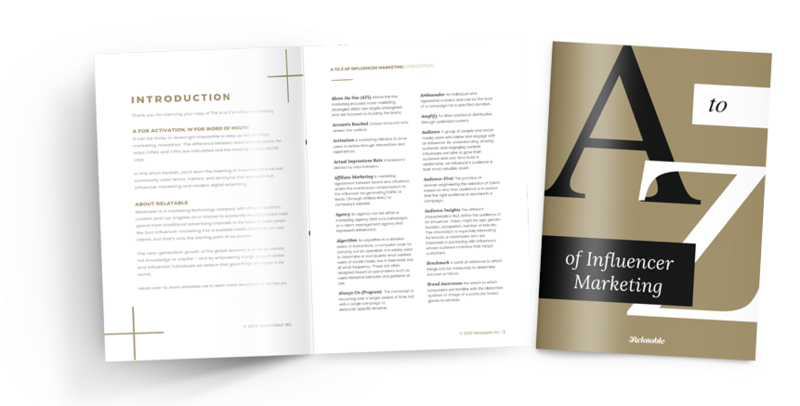 In this short booklet, you'll learn the meaning of more than 100 of the most commonly used terms, metrics and acronyms that are used in both influencer marketing and modern digital advertising. Relatable is a marketing technology company with offices in Stockholm, London and Los Angeles on a mission to accelerate the shift in global media spend from traditional advertising channels to the future of media; people. We turn influencer marketing into a scalable media channel for our many clients, but that's only the starting point of our journey. Head over here to learn more about how we can help you.